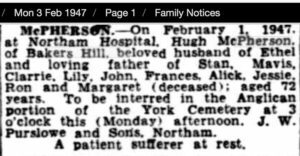 Above: death of Hugh McPherson in 1947. 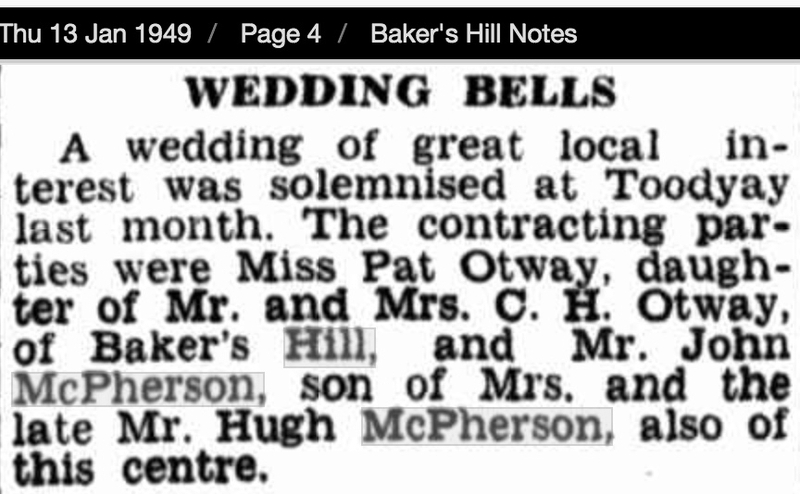 Hugh McPherson married 1906 at Northam to Ethel Margaret McPherson. 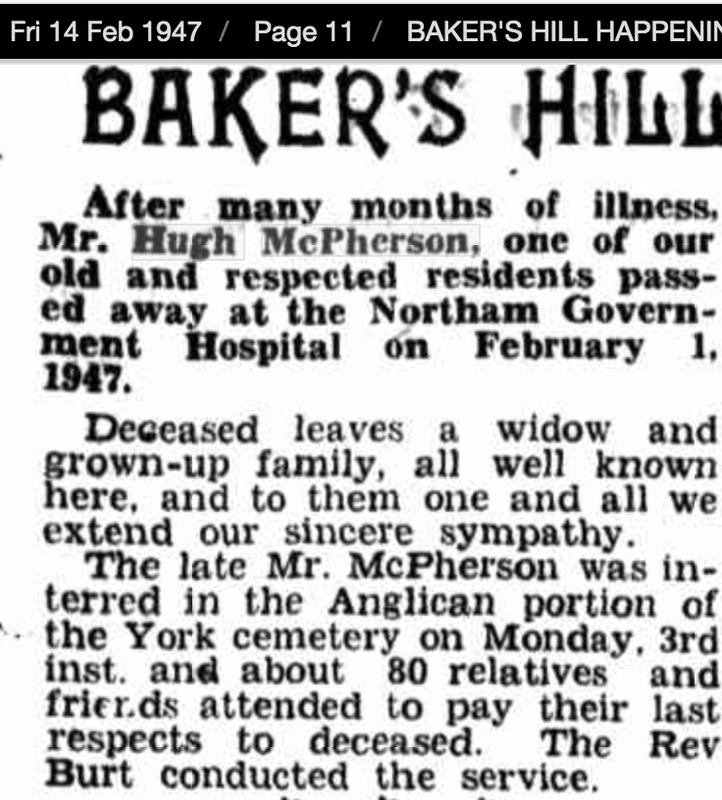 The McPherson family of Bakers Hill had a large family of 10 children. Hugh McPherson was employed with the Waterworks, and had a small farming property. During his 20’s young John McPherson managed a few scrapes with ‘the law’. 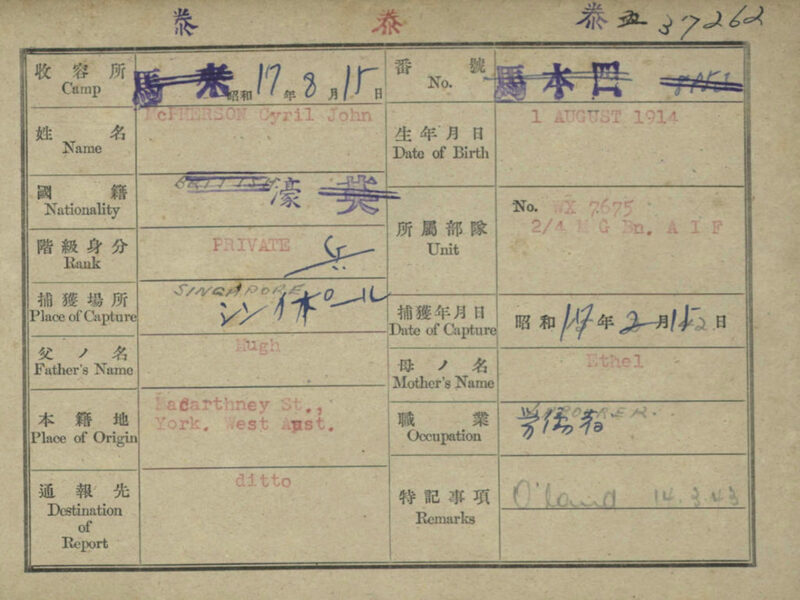 He enlisted in 1940 aged 26 years. 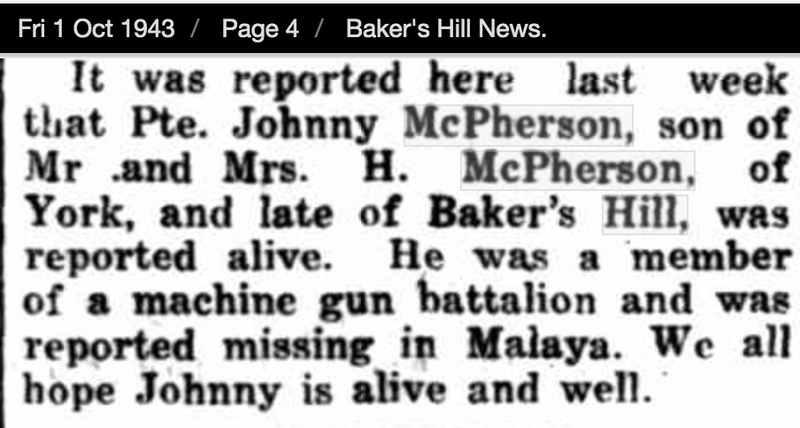 When he returned from war John McPherson returned to living at Bakers Hill. 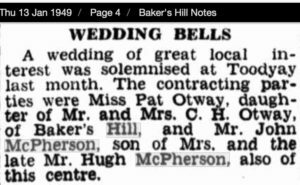 At the end of 1948 he married local girl Pat Otway. In 1958 John remarried to Norma Joyce Johnson, and after the couple resided in Perth. Throughout the 1960s and 1980’s John and Norma McPherson resided around Dianella, Inglewood. 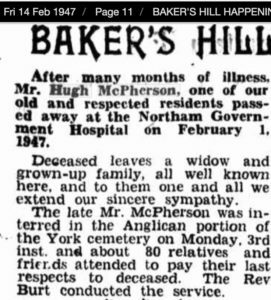 Cyril ‘John’ (Mac) McPherson died in 1995 aged 81 years at Beechboro. 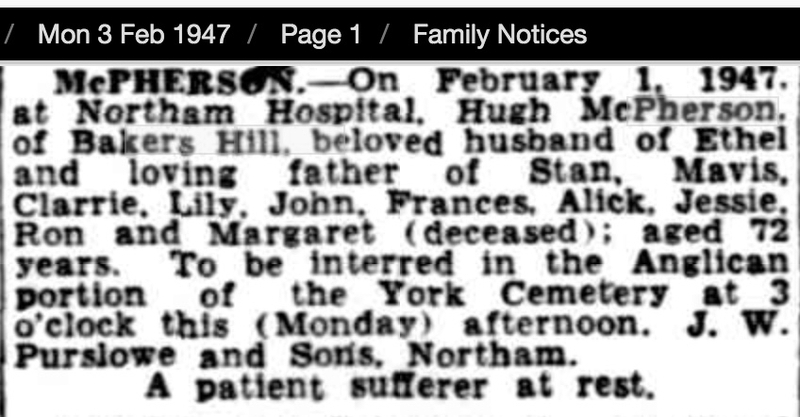 His wife Norma died 1997 aged 75 years. Both are buried Karrakatta Cemetery. Mac was selected at Singapore to work on the Burma-Thai Railway with ‘D’ Force Thailand, S Battaliion which departed Singapore Railway Station 14 May 1943 for Thailand. Conditions were pretty terrible and the men crowded into tiny carriages for the 4-5 day journey where the nights were freezing cold and the days stinking hot. Please read about S Battalion which with A Force Green Force, had the largest numbers of 2/4th men of all the work forces. When the rail was completed by end of 1943 and the Japanese began to regroup all the POWs from Thailand and Burma at one of the large camps or hospitals in Thailand, many 2/4th of S Battalion ended up at Tamuang Camp where they were deemed ‘fit’ by the Japanese and selected to work in Japan. 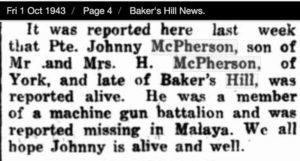 We cannot be absolutely precise as there are no records, but assume John was not well and later was sent to Konkoita, or went to Konkoita from the Hellfire region. At the end of the war he was recovered from Thailand.